Sometimes you want a simple snack that tastes good and doesn’t require too much time or ingredients. Well, here are 3 options you can choose from. Two are sweet and one is salty. And you can always make your own variation of each. I recently saw this recipe in RedBook magazine and decided to give it a try. I have seen people eat peanut butter and apples before, but never with granola. I didn’t have any granola on hand so I use some rolled oats I bought at Target. 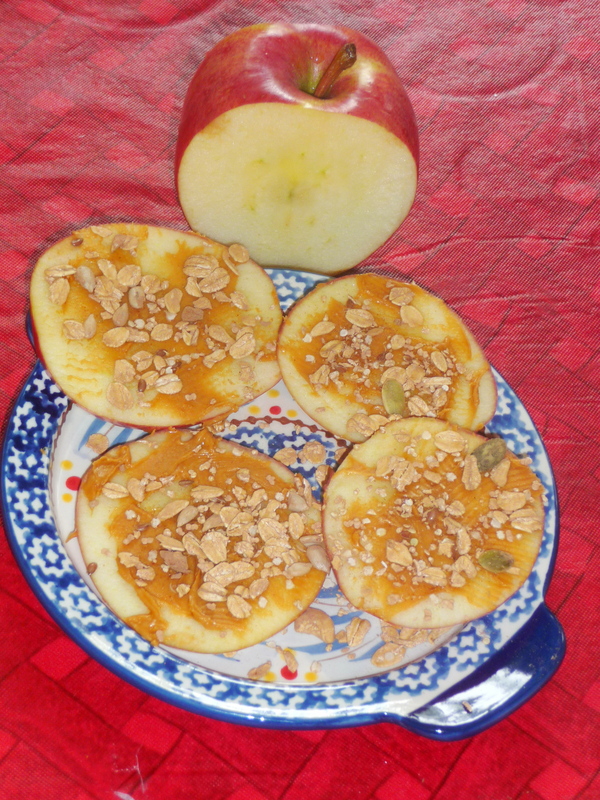 All you have to do is slice an apple, spread peanut butter on one side, and cover with granola or oats. The oats I used had cocoa powder, nuts and seeds as well, but no sugar. This is very easy and delicious. It is a great item for breakfast or an afternoon snack. Use a piece of whole-wheat bread and spread a little butter on it. 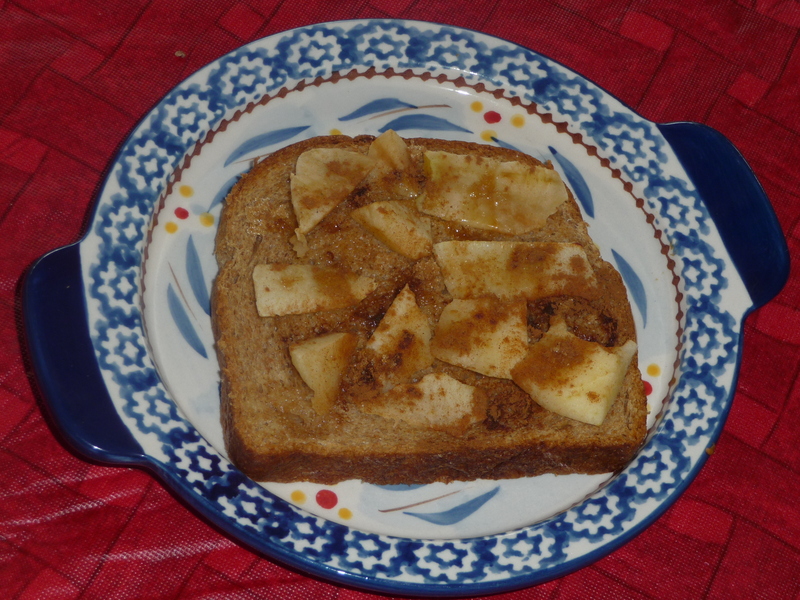 Then add apple slices and a little sprinkle of brown sugar and cinnamon. Broil in toaster oven for about 4 minutes, keep an eye on it as everyone likes their toast cooked a little different. When there is not much in the house to eat or I just feel like some pizza, I usually make these mini pizzas. 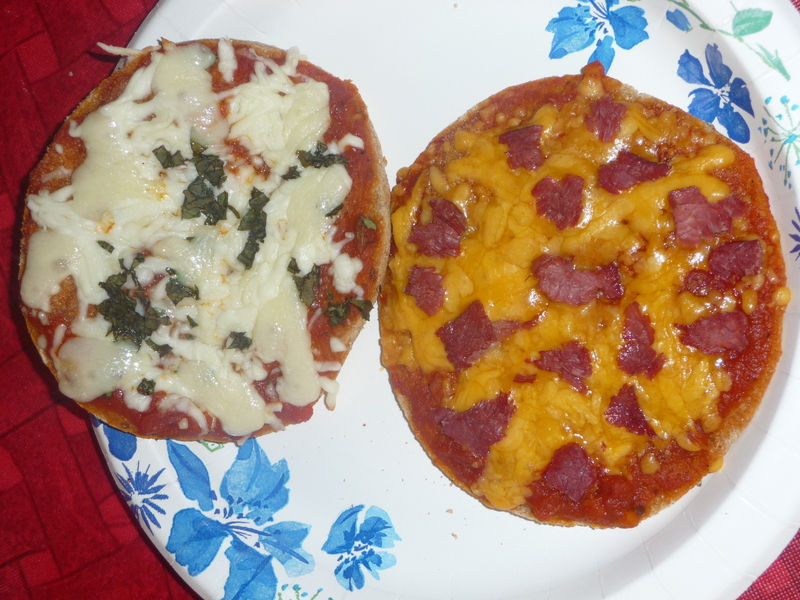 It requires the same ingredients as a regular pizza except you use Arnolds Whole Wheat sandwich thins for the crust. There are other brands of sandwich thins, but I like Arnolds the best. In the picture, one pizza has tomato sauce, garlic powder, mozzarella and swiss cheese and fresh basil. The second pizza has tomato sauce with cheddar cheese and corn beef. The only reason I used corn beef was because we had some leftover and that was the only meat I had around. It tasted pretty good. Of course you can easily substitute pepperoni. I cooked mine in the toaster oven for 10 minutes at 350 degrees. Make your pizza however you like. I usually like onions on mine. Other snacks I like are mixed raw nuts, veggies and dip, cucumbers with tuna, and a small smoothie. Do you have any favorite snack recipes? I would like to hear your unique creations, share them in the comment section below. I found this recipe on the-girl-who-ate-everything.com and thought it looked interesting. I made this for 4th of July and it was so good!! It reminds me of a strawberry cheesecake. It is a little messy, but not too difficult to make. I wanted a dessert that was different, yet didn’t require too many ingredients. I’m a crust girl, to me the best part of the cheesecake is the crust (if it is done right that is). This pretzel crust is the perfect combination of salty and sweet and super yummy. 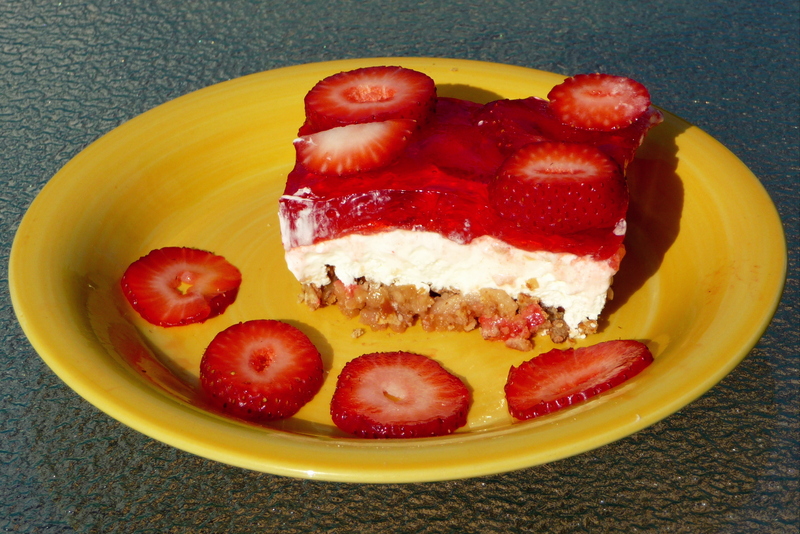 Give this recipe a try if you like strawberry cheesecake. 1. Make the Jello as directed on the box and add strawberries. Refrigerate until partially set. I used the fast process on the box (using half water half ice) and left my jello in the fridge for about 1 1/2 hours. It may take longer if you just use water. Just make sure it is not too watery or it will make the crust soggy. 2. When jello is almost ready, preheat oven to 350 degrees. 3. Combine the crushed pretzels, brown sugar and melted butter and press it in a greased 9 x 13 pan. I lined my pan with parchment paper instead of greasing it. If the crust is too dry and is not sticking well, you can add more melted butter. 4. Bake crust for 10 minutes. 5. Combine cream cheese and sugar in a bowl and beat with hand mixer until smooth. Then add cool whip and beat to combine fully. 6. Once the crust is cool, add the cream cheese layer on top of the crust and smooth it out. Make sure you smooth it out all the way to the corners. 7. Pour the jello on top over the cream cheese layer. I scooped my jello out with a spoon. Then place in fridge to cool. 8. It is best to wait a few hours for it to set before eating. I thought it tasted best the next day. You can add more fresh strawberries on top if you wish.